As part of my honours project at The University of Western Australia in 2007, I researched Paleocene elasmobranchs (sharks and rays) from the Boongerooda Greensand Formation, Western Australia. I collected approximately 200 kg of greensand, which I sieved through and identified just over 3000 elasmobranch teeth. I then used SEM to photograph the most well preserved, or most significant finds. 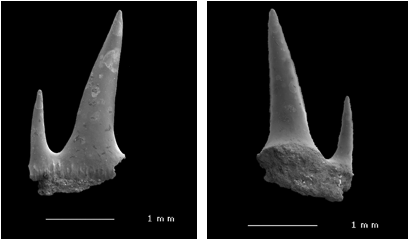 Labial and lingual view of Palaeohypotodus rutoti. Syme, C., 2007. Elasmobranchs (Hexanchiformes, Squatiniformes, Squaliformes, Lamniformes, Carchariniformes, Orectolobiformes, Torpediniformes, Myliobatiformes) from the Boongerooda Greensand, Paleocene, Western Australia. Unpublished Honours Thesis, School of Earth and Environment, The University of Western Australia, 159 pp.